Wotog Blog » Wotography's photo blog! For those who aren't aware, we moved back to California this past summer for Alicia's medical residency program. So when Megan and Guy first asked us about photographing their Chicago winter wedding, we were super flattered to be asked to travel so far to cover their special day...but worried that our now thin blood wouldn't be able to handle the "norm" for that time of year -- cloudy, damp/snowy, and icy cold. But we were all pleasantly surprised by a gorgeous sunny day with temps in the low 50s! It was a direct reflection of the happiness and excitement that filled the day for Megan and Guy and their family and friends. Clearly this marriage was one eagerly awaited by literally hundreds of people -- and to prove it they came from all over the world (Europe, South America, and across the US) to share in Megan and Guy's celebration and dance the night away. 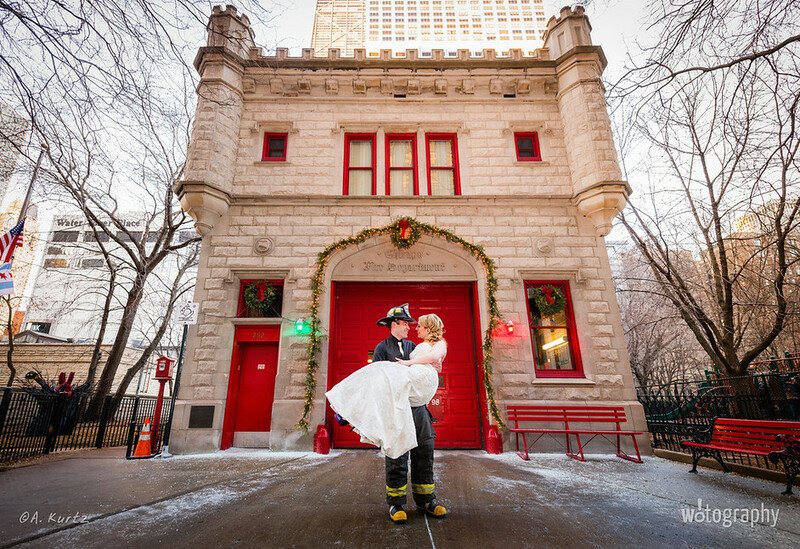 Perhaps the most fun we had that day was taking photos at the Chicago Firehouse downtown where Guy works as a firefighter/paramedic. The timing worked out perfectly so that we were even able to use one of the trucks! Nothing like a bridal party hanging around a fire truck with flashing lights to get a couple wedding photographers excited. ;] From there we hit up a few spots on Michigan Avenue with Megan our fearless bride walking all around in the evening wind with no coat and 4-inch purple heels -- and all with a smile! 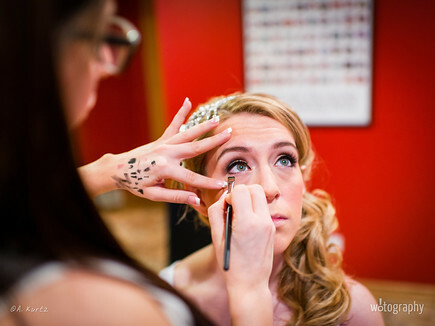 She is seriously a trooper and one of the most go-with-the-flow brides we've ever worked with. Even in the midst of a jam-packed day filled with lots of excitement and tons of people, the thing we enjoyed watching most was the way Megan and Guy clearly love and care for each other. Just like their engagement session, the cute moments came very naturally to them and we rarely had to prompt them to hold hands, kiss, or look/smile at each other since they couldn't seem to stop doing that candidly! Megan and Guy -- we had such a great time photographing your wedding and are so happy for the two of you. Thank you so much for letting us be a part of your celebration! 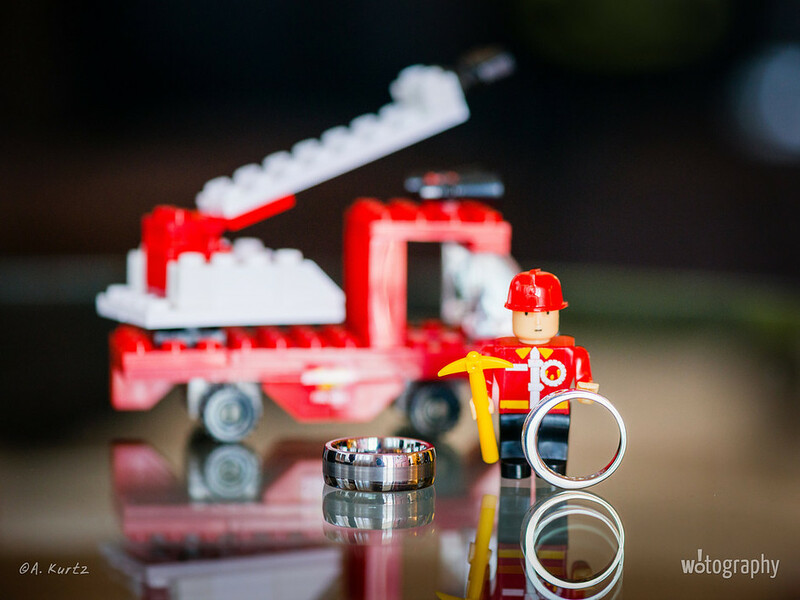 We hope you enjoy your wedding images as much as we did capturing them! Justin was a classmate of Alicia's in medical school, now a pediatrics resident at the University of Chicago. We went on a trip to West Virginia with him and his lovely bride, Rachel (a nurse) a few years ago, and of course we also did a downtown Chicago e-session with them last fall. Their wedding in Grand Rapids, Michigan was truly a pleasure to photograph. It went SO smoothly from start to finish -- the only wedding we can recall that ran AHEAD of schedule all day! Rachel and Justin made some smart decisions that helped keep us on track and allowed us a huge amount of relaxed photo time. They trusted us with their "detail" items like rings, dress, and shoes for an hour the evening before their wedding. We've never had the opportunity to do this before, and we loved it! (How often does anyone get a chance to get the moon in a wedding dress photo??) It was great to have time to get these shots in a beautiful setting like the JW Marriott, and it allowed us to focus just on "people pictures" the next morning. Special thanks to my second photographer and lovely wife, Alicia. You are always an absolute joy to work with, and you get more and more great photos with every wedding we shoot together. Finally, Rachel and Justin -- you made all of this possible. Thank you!! It has been an absolute pleasure getting to know you these past few years, and we wish you all the best as you start an exciting new chapter in your lives together. Enjoy your photos!! This is part two of a Catholic/Hindu double-header wedding. In case you missed part one, you can find the Catholic ceremony here, and you should definitely check out the couple's holi powder e-session and downtown Chicago e-session if you haven't yet. Chayal and Emil -- thank you both so much for letting us capture your special day! It was truly our pleasure and an experience we're still talking about. We wish you both the best of luck as you begin your new life together in Cleveland! Emil was one of Alicia's classmates in medical school, and he has one of those personalities you'll never forget -- full of life, always smiling, and enthusiastic about everything. He's the kind of guy whose smiles are contagious and whose energy fills the room. When we first learned he was engaged, we knew we had to meet this girl since it would take someone pretty special to be a match for this guy! Within five minutes of knowing Chayal, it was clear how they ended up together. She is just as full of enthusiasm and life as Emil, and when they're together, their energy combines into one big ball of equal parts fun and love for each other. When they got engaged, they chose to celebrate with two e-sessions -- one showing off their fun side, and the other more romantic. So in true Emil and Chayal fashion, they decided to kick off their marriage with not just one, but two weddings to acknowledge the religion and culture of each of their families. The first was a reflection of Emil's upbringing -- a traditional Catholic ceremony at St. Matthew's Church in Schaumburg, IL. Surrounded by close family and friends, it was a more intimate gathering followed by some photo time with the bridal party at a nearby park. But between the beautiful contrast of Chayal's freshly Henna'd hands against her bright white dress and the countless saris in the crowd, there were already hints of the next morning's Hindu festivities all around. It's uncommon for us to meet a couple for the very first time at their engagement session. The situation leaves everyone a little on edge because we are hoping the couple will be fun and relaxed in front of the camera, and the couple is hoping that we will make them feel at ease and get some really great photos of them. Thankfully, with Megan and Guy the initial uncertainty melted away almost immediately. It felt like we had known them for a while because they were easy to get along with, casual, and fun! One of the first things we noticed was that Megan wore a bright colored dress with some awesome 3-inch heels -- and then proceeded to hike 2 miles from Millennium Park to Adler Planetarium in those heels with ease. Color us impressed! Guy had a great sense of humor and was incredibly sweet to Megan. His down-to-earth personality and their go-with-the-flow attitudes made their e-session a piece of cake. Megan and Guy -- it was so great getting to know you. Thanks for being such troopers with all the walking and unexpectedly frigid winds. (Perhaps it was good practice for your upcoming winter wedding?) ;] We can't wait to be part of your special day in December.